Poetry is at bottoma criticism of life. 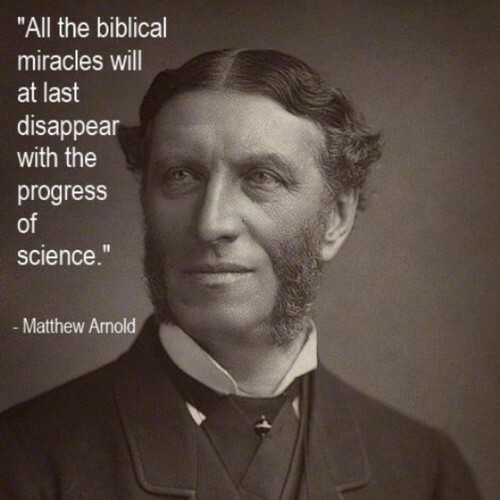 All the biblical miracles will at last disappear with the progress of science. His expression may often be called bald…but it is bald as the bare mountain tops are bald, with a baldness full of grandeur. The difference between genuine poetry and the poetry of Dryden,Pope, and all their school, is briefly this: their poetry is conceived and composed in their wits, genuine poetry is conceived and composed in the soul. More and more mankind will discover that we have to turn to poetry to interpret life for us, to console us, to sustain us.Without poetry, our science will appear incomplete; and most of what now passes with us for religion and philosophy will be replaced by poetry. In poetry, no less than in life, he is ‘a beautiful and ineffectual angel, beating in the void his luminous wings in vain’. The theatre is irresistible: organise the theatre. So we have the Philistine of genius in religion—Luther; the Philistine of genius in politics—Cromwell; the Philistine of genius in literature—Bunyan. But there remains the question: what righteousness really is. The method and secret and sweet reasonableness of Jesus. The true meaning of religion is thus not simply morality, but morality touched with emotion. Culture is the passion for sweetness and light, and (what is more) the passion for making them prevail. Hebraism and Hellenism—between these two points of influence moves our world. That vast portion…of the working-class which, raw and half-developed has long lain half-hidden amidst its poverty and squalor, and is now issuing from its hiding-place to assert an Englishman’s heaven-born privilege of doing as he likes, and is beginning to perplex us by marching where it likes, meeting where it likes, bawling what it likes, breaking what it likes—to this vast residuum we may with great propriety give the name of Populace. The pursuit of perfection, then, is the pursuit of sweetness and light… He who works for sweetness and light united, works to make reason and the will of God prevail. Coldly, sadly descends The autumn evening. The field Strewn with its dank yellow drifts Of withered leaves, and the elms, Fade into dimness apace, Silent;—hardly a shout From a few boys late at their play!